The Maxwell Football Club and Pro Football Focus have once again teamed up to narrow down the list of semifinalists for the Maxwell Award, given at the end of the 2018 NCAA football season. While we highlighted the semifinalists for the Bednarik Award earlier this week, we wanted to also be sure to highlight those who were named to the list for the Maxwell Award in a similar fashion once it was announced by our friends at the MFC. With the list in hand, today we highlight those 20 athletes who were named as Maxwell Award Semifinalists and a little bit behind their 2018 season grade to date. If you’ve followed PFF this season, you know how high we are on Tagovailoa’s year to date. If you’ve watched any college football this season, you know how well Tagovailoa has been for the Crimson Tide in 2018. That being said, all the talk and all the hype is completely justified as, despite the competition (can you really blame the players for beating whoever is on their schedule? ), Tagovailoa has put forth incredible numbers in his first season as the starter for Alabama. His 67.9 deep pass adjusted completion percentage is the highest in the nation and his near-perfect 156.9 passer rating from a clean pocket is also alone atop the national leaderboard this year. King may be overlooked in his own conference for the likes of McKenzie Milton but that is no fault of his own as he is living in the shadows no more. King has thrown 10 touchdowns on deep passes this season, tying him for fifth-most in the country. His play from a clean pocket has also been sensational as his 135.0 passer rating when kept clean is also fifth among the nation’s signal-callers. After knocking USF from the ranks of the unbeaten last week, King and his Cougars are just a 14-point loss away from an undefeated record but are staring down a potential AAC Championship game berth at this rate. Sure, you remember the time that McMaryion was lighting up the scoreboards for Oregon State back in 2015-16 but what you may have missed was his under-the-radar performance in 2017 with Fresno State. 2018 has been no surprise to us at PFF as he’s followed up a strong 87.9 overall grade in 2017 with more strong play this season. Currently fifth in the country with a 79.4% adjusted completion percentage, McMaryion has taken the Bulldogs from relative unknown to potential College Football Playoff spoiler to even a contender for the Group of 5’s spot in a New Year’s Day bowl game. Not even the starter when the season began, Book replaced Fighting Irish QB Brandon Wimbush and the team has not looked back. Book is currently the nation’s leader in adjusted completion percentage (the PFF metric that takes into account completion percentage on all ‘aimed’ passes) as he’s thrown a catchable pass on 83.5% of his attempts this year. Murray’s touch and accuracy have been on display for the Sooners this season, replacing the reigning Heisman Trophy winner and first overall selection of the 2018 NFL Draft, Baker Mayfield. Murray is currently second in the nation with his 80.9% adjusted completion percentage as after you get rid of intentional throwaways, dropped passes, passes in which he was hit as he threw and those batted by defensive linemen, Murray has completed 134-of-167 attempts this year. Despite having six of his deep attempts dropped this season (most in the FBS), Herbert has still completed 20 deep balls and thrown for nine touchdowns on deep passes, good enough for the 10th-most in the country. He’s been incredibly strong when getting the ball out quick, compiling a 110.8 passer rating on throws within 2.5 seconds of the snap – third in the Pac-12. Penn State has had to grind out a few victories this season while they’ve thrown the game on the shoulder (or legs) of their signal-caller more than once as well. Even in defeat this year, McSorley has outplayed his opposing quarterback, most notably in the loss to Ohio State where McSorley outgraded Haskins by nearly 30.0 grade points. In total, McSorley has put up solid passing numers despite having 10.4% of his passes dropped this season, the most of any FBS quarterback. 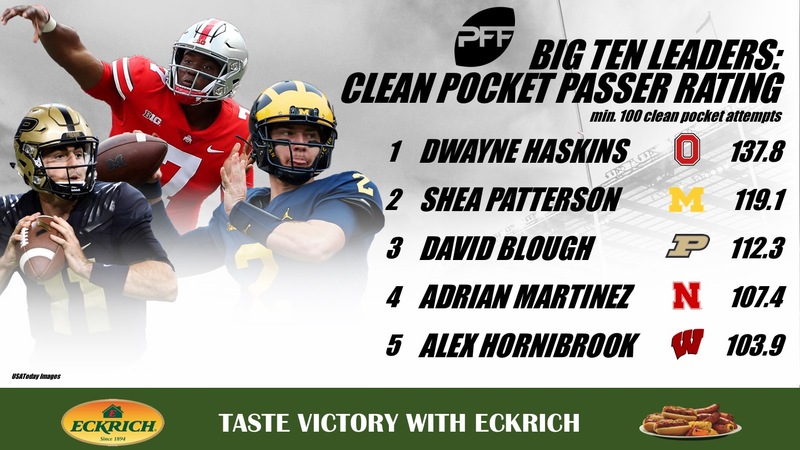 Haskins has thrived when kept clean from pressure in the pocket, fielding the country’s fourth-highest passer rating when not under pressure at 137.8. He’s thrown 28 touchdowns when clean to lead the nation as well as 2,546 passing yards, good enough for third. Although he’s struggled in two of his road contests this season, Haskins still has shown great poise and presence in leading the Ohio State passing attack to new heights in 2018. Milton is up to his usual tricks this season, repeating his spot on this list after an incredible 2017 year. Milton’s deep-pass passer rating fo 114.4 is fourth in his conference as those numbers nearly mirror his play from a clean pocket (112.4 passer rating). He’s incredibly gifted throwing from a clean pocket but also has no trouble throwing if he’s pressured. His 91.8 passer rating when under pressure is the 16th-best among all the nation’s quarterbacks. The Washington State offense, by their nature, throws a high volume of passes under head coach Mike Leach. Minshew, a grad-transfer from ECU, has come in and immediately grasped the offensive scheme in Pullman, but his natural ability and talented arm have been on full display. He’s tied with the aforementioned Murray for second in terms of adjusted completion percentage, despite the volume of his pass attempts – throwing a catchable pass on 80.9% of his throws. One of the more stable metrics, if not the most stable metric here at PFF is passer rating when kept clean from pressure in a clean pocket. Grier has improved in that regard from a season ago and currently sits at third among the nation’s signal-callers with a 140.3 passer rating when kept clean. Combine that with the fact that he’s one of the country’s most prolific deep-ball throwers and you have yourself one outstanding quarterback. 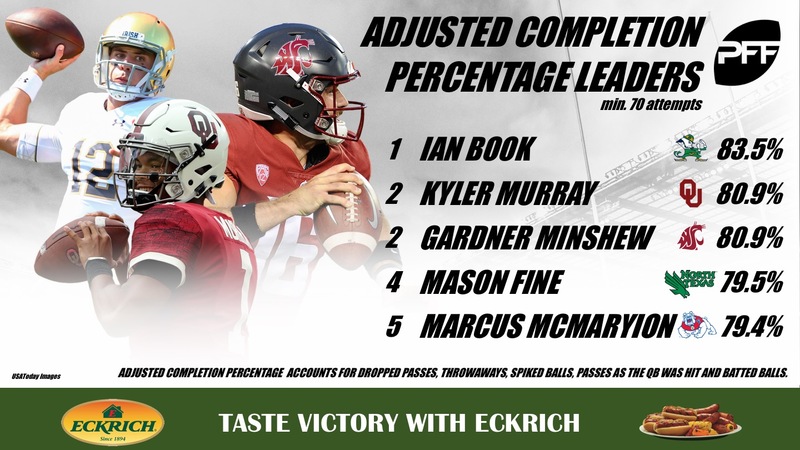 This update on the Maxwell Award Semifinalists at PFF is brought to you by Eckrich, the Official Smoked Sausage of the College Football Playoff. Another repeat from last year’s semifinalist list, Taylor has run through and around opponents this year. One of only four running backs to top the 1,000-yard rushing total at this point of the season, Taylor is second in the country with 692 yards after contact this year. He has 29 runs of 10 or more yards and accumulated 47 first downs on his 180 carries to go along with his eight touchdowns. Moss has had no trouble breaking tackles himself, forcing 40 on his 161 carries. He averages 3.47 yards after contact per attempt and has scored 10 touchdowns this season for the Utes. His 51 combined first downs and touchdowns are good enough for fourth among the nation’s running backs. Higdon has done his damage in bunches this season, tallying 825 yards and 515 yards after contact. He’s forced 23 missed tackles on his carries and despite a crowded backfield, Higdon has run for 33 first downs and an additional six touchdowns. On pace to set a career-high in missed tackles forced, Snell has broken out in Year 3 at Kentucky. Pacing the SEC in rushing yards, his 938 total rushing yards are good enough for seventh nationally while his 608 yards after contact aregood enough for sixth. Snell’s 52 combined first downs and touchdowns are second to only Taylor this year. No running back has come close to Henderson’s gaudy numbers this season as the Memphis star is averaging 10.1 yards per carry and has accumulated 770 yards after contact. Only 22 other running backs this season have more total rushing yards than Henderson has after first contact. Dillon has been unstoppable when healthy for the Eagles in 2018, rushing for a total of 796 yards and 33 combined first downs and touchdowns. He has forced 31 missed tackles on just 138 carries as he averages 3.53 yards after contact per attempt. While he’s second in touchdowns this season with 14, Etienne has scored a touchdown or a first down on a whopping 41.6% of his carries this year. He’s forced 28 missed tackles on just 108 carries and gained 408 of his 844 total rushing yards after contact. The do-it-all receiver for the Buffaloes has been slowed by an injury but that shouldn’t keep him off the field much longer. 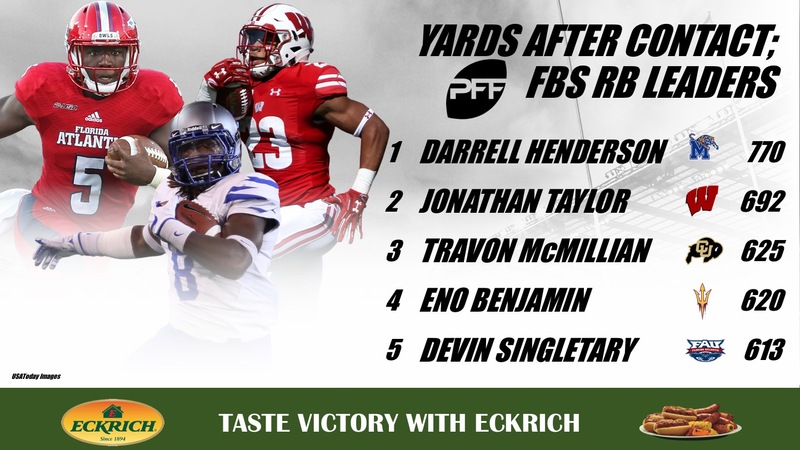 Despite missing the past two games, Shenault is still tied atop the leaderboard among FBS receivers with 23 missed tackles forced after the catch and is second in yards after the catch with 535. Add in his 79 rushing yards and five rushing touchdowns and the picture of his total impact has been painted. Rocketing up the true freshman rankings here at PFF, Moore had a statement game in the win against Ohio State just two weeks ago. For his efforts now, Moore is currently the nation’s leader at the receiver position in both missed tackles forced (23) and yards after the catch (551). He’s also hauled in 74.7% of the passes thrown his way and averages 11.8 yards per reception. Maxwell Football Club President, Mark Dianno, announced the 2018 semifinalists for the 82nd Maxwell Award for the Collegiate Player of the Year and the 24th Chuck Bednarik Award for the Outstanding Defensive Player of the Year. The respective lists include a field of 20 candidates for the Maxwell and Bednarik Awards as selected by the Maxwell Football Club National Selection Committee. The Maxwell Football Club has once again teamed with Pro Football Focus (PFF) and Phil Steele Publications as selection committee partners. PFF provides detailed statistical and performance-based assessments to selection committee staff, and several senior PFF analysts have been added to our committee and have participated in the selection process. Phil Steele’s Football Guide is generally recognized as the most complete football reference in the country. A strong field of Maxwell Award semifinalists includes a representative from every Power Five conference as well as four student-athletes from Group of Five schools. Wisconsin running back Jonathan Taylor and UCF quarterback McKenzie Milton are returners from last year’s semifinalist list.